Bil Yaris by Android game developer Yyurduseven brings nearly 3,000 free quiz questions to Turkish speakers around the globe. Players can test their knowledge in categories such as general culture, history, literature, sports, geography and theater. The game ends after three wrong answers, so players must be careful and choose their answers wisely. At the end of the game, players haev the opportunity to submit their scores to the online global leaderboards and see hwo they compare with others. We're happy to announce that Yyurduseven has now released two very popular Turkish games on the Swarm platform. Nice work Yyurduseven! Do you speak Turkish? Do you want to learn? Do you think you're smart? 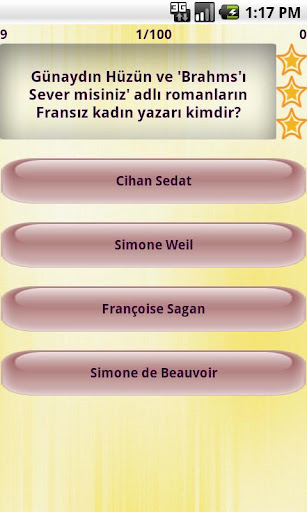 Try Bil Yaris, a new, popular Turkish quiz game for Android!